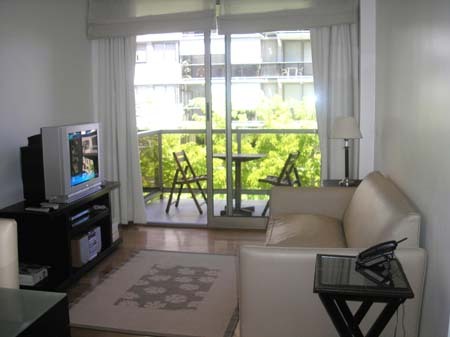 Lovely and bright apartment in the new residential neighborhood of Puerto Madero. One bedroom and one complete bathroom. Balcony. Kitchen, dining area and living room with sofa bed. The apartment is situated in the Brisas building of Puerto Madero and has been decorated with great taste. The building offers a complete Gym, Swimming pool, Paddling pool, Sauna, Laundry and a Parking space (optional). The living room is connected with the kitchen, it is fully-equipped. The bedroom has an elegant queen size bed. Air conditioning. Heating. Cable TV, DVD. CD Stereo. Cleaning service. 24 hrs security. Swimming-pool, Laundry, Sauna and Gym . Garage(optional). Included: Electricity, gas, water, Internet, telephone ( local calls),building and city taxes.